This article is about the ornamental fish. For other uses, see Koi (disambiguation). Koi (鯉, English: /ˈkɔɪ/, Japanese: [koꜜi]) or more specifically nishikigoi (錦鯉, [ɲiɕi̥kiꜜɡoi], literally "brocaded carp"), are colored varieties of Amur carp (Cyprinus rubrofuscus) that are kept for decorative purposes in outdoor koi ponds or water gardens. (video) Several koi swim around in a pond in Japan. Koi is an informal group of the colored variants of C. carpio. Several varieties are recognized by the Japanese. Koi varieties are distinguished by coloration, patterning, and scalation. Some of the major colors are white, black, red, orange, yellow, blue, and cream. The most popular category of koi is the Gosanke, which is made up of the Kohaku, Taisho Sanshoku, and Showa Sanshoku varieties. The Amur carp (Cyprinus rubrofuscus), a member of the cyprinid family species complex native to East Asia, was aquacultured as a food fish at least as long ago as the fifth century BC in China, and Jin Dynasty (fourth century AD) texts mentioned carp with various colors. The Amur carp was previously recognized as a subspecies of the common carp (as C. c. haematopterus), but recent authorities treat it as a separate species under the name C. rubrofuscus. Amur carp were first bred for color in Japan in the 1820s, initially in the town of Ojiya in the Niigata Prefecture on the northeastern coast of Honshu island. The outside world was unaware of the development of color variations in Japanese koi until 1914, when the Niigata koi were exhibited at an annual exposition in Tokyo. From that time, interest in koi spread throughout Japan. From this original handful of koi, all other Nishikigoi varieties were bred, with the exception of the Ogon variety (single-colored, metallic koi), which was developed relatively recently. The hobby of keeping koi eventually spread worldwide. They are now sold in many pet aquarium shops, with higher-quality fish available from specialist dealers. The collection of koi throughout the years has become quite the social hobby for many who have ponds. It is also common for hobbyists who are passionate about their koi to join a club specifically for their koi and ponds. Members tend to share their knowledge of the fish with others and even help each other out when they are in need of help with their koi. The word "koi" comes from Japanese, simply meaning "carp". It includes both the dull grey fish and the brightly colored varieties. What are known as koi in English are referred to more specifically as nishikigoi in Japan (meaning "brocaded carp"). In Japanese, koi is a homophone for another word that means "affection" or "love", so koi are symbols of love and friendship in Japan. In the past, koi were commonly believed to have been bred from the common carp (Cyprinus carpio). Extensive hybridization between different populations, coupled with widespread translocations, have muddled the historical zoogeography of the common carp and its relatives. Traditionally, Amur carp (C. rubrofuscus) were considered a subspecies of the common carp, often under the scientific name C. carpio haematopterus. However, they differ in meristics from the common carp of Europe and Western Asia, leading recent authorities to recognize them as a separate species, C. rubrofuscus (C. c. haematopterus being a junior synonym). Although one study of mitochondrial DNA (mtDNA) in koi was unable to find a clear genetic structure matching the geographic populations (possibly because of translocation of carp from separate regions), others based on mtDNA, microsatellite DNA and genomic DNA found a clear separation between the European/West Asian population and the East Asian population, with koi belonging in the latter. Consequently, recent authorities have suggested that the ancestral species of the koi is C. rubrofuscus (syn. C. c. haematopterus) or at least an East Asian carp species instead of C. carpio. Regardless, a taxonomic review of Cyprinus carp from eastern and southeastern Asia may be necessary, as the genetic variations do not fully match the currently recognized species pattern, with one study of mtDNA suggesting that koi are close to the Southeast Asian carp, but not necessarily the Chinese. Koi varieties are distinguished by coloration, patterning, and scalation. Some of the major colors are white, black, red, yellow, blue, and cream. Although the possible colors are virtually limitless, breeders have identified and named a number of specific categories. The most notable category is Gosanke, which is made up of the Kohaku, Taisho Sanshoku, and Showa Sanshoku varieties. New koi varieties are still being actively developed. Ghost koi developed in the 1980s have become very popular in the United Kingdom; they are a hybrid of wild carp and Ogon koi, and are distinguished by their metallic scales. Butterfly koi (also known as longfin koi, or dragon carp), also developed in the 1980s, are notable for their long and flowing fins. They are hybrids of koi with Asian carp. Butterfly koi and ghost koi are considered by some to be not true nishikigoi. Kōhaku (紅白) is a white-skinned koi, with large red markings on the top. The name means "red and white"; kohaku was the first ornamental variety to be established in Japan (late 19th century). Taishō Sanshoku (or Taishō Sanke) (大正三色) is very similar to the kohaku, except for the addition of small black markings called sumi (墨). This variety was first exhibited in 1914 by the koi breeder Gonzo Hiroi, during the reign of the Taishō Emperor. In the United States, the name is often abbreviated to just "Sanke". The kanji, 三色, may be read as either sanshoku or as sanke (from its earlier name 三毛). Shōwa Sanshoku (or Showa Sanke) (昭和三色) is a black koi with red (hi 緋) and white (shiroji 白地) markings. The first Showa Sanke was exhibited in 1927, during the reign of the Shōwa Emperor. In America, the name is often abbreviated to just "Showa". The amount of shiroji on Showa Sanke has increased in modern times (Kindai Showa 近代昭和), to the point that it can be difficult to distinguish from Taisho Sanke. The kanji, 三色, may be read as either sanshoku or as sanke. Tanchō (丹頂) is any koi with a solitary red patch on its head. The fish may be a Tanchō Shōwa, Tanchō Sanke, or even Tanchō Goshiki. It is named for the Japanese red-crowned crane (Grus japonensis), which also has a red spot on its head. Chagoi (茶鯉), "tea-colored", this koi can range in color from pale olive-drab green or brown to copper or bronze and more recently, darker, subdued orange shades. Famous for its docile, friendly personality and large size, it is considered a sign of good luck among koi keepers. Asagi (浅黄) koi is light blue above and usually red below, but also occasionally pale yellow or cream, generally below the lateral line and on the cheeks. The Japanese name means pale greenish-blue, spring onion color, or indigo. Utsurimono (写り物) is a black koi with white, red, or yellow markings, in a zebra color pattern. The oldest attested form is the yellow form, called "black and yellow markings" (黒黄斑, Kuro ki madara) in the 19th century, but renamed Ki Utsuri (黄写り) by Elizaburo Hoshino, an early 20th-century koi breeder. The red and white versions are called Hi Utsuri (緋写り) and Shiro Utsuri (白写り) (piebald color morph), respectively. The word utsuri means to print (the black markings are reminiscent of ink stains). Genetically, it is the same as Showa, but lacking either red pigment (Shiro Utsuri) or white pigment (Hi Utsuri/Ki Utsuri). Bekko (鼈甲、べっ甲) is a white-, red-, or yellow-skinned koi with black markings sumi (墨). The Japanese name means "tortoise shell", and is commonly written as 鼈甲. The white, red, and yellow varieties are called Shiro Bekko (白), Aka Bekko (赤) and Ki Bekko (黄), respectively. It may be confused with the Utsuri. Goshiki (五色) is a dark koi with red (Kōhaku style) hi pattern. The Japanese name means "five colors". It appears similar to an Asagi, with little or no hi below the lateral line and a Kōhaku Hi pattern over reticulated (fishnet pattern) scales. The base color can range from nearly black to very pale, sky blue. 'Shūsui (秋翠) means "autumn green"; the Shūsui was created in 1910 by Yoshigoro Akiyama（秋山　吉五郎, by crossing Japanese Asagi with German mirror carp. The fish has no scales, except for a single line of large mirror scales dorsally, extending from head to tail. The most common type of Shūsui has a pale, sky-blue/gray color above the lateral line and red or orange (and very, very rarely bright yellow) below the lateral line and on the cheeks. Kinginrin (金銀鱗) is a koi with metallic (glittering, metal-flake-appearing) scales. The name translates into English as "gold and silver scales"; it is often abbreviated to Ginrin. Ginrin versions of almost all other varieties of koi occur, and they are fashionable. Their sparkling, glittering scales contrast to the smooth, even, metallic skin and scales seen in the Ogon varieties. Recently, these characteristics have been combined to create the new ginrin Ogon varieties. Kawarimono (変わり物) is a "catch-all" term for koi that cannot be put into one of the other categories. This is a competition category, and many new varieties of koi compete in this one category. It is also known as kawarigoi (変わり鯉). Ōgon (黄金) is a metallic koi of one color only (hikarimono 光者). The most commonly encountered colors are gold, platinum, and orange. Cream specimens are very rare. Ogon compete in the Kawarimono category and the Japanese name means "gold". The variety was created by Sawata Aoki in 1946 from wild carp he caught in 1921. Kumonryū (九紋竜)' （literally "nine tattooed dragons" is a black doitsu-scaled fish with curling white markings. The patterns are thought to be reminiscent of Japanese ink paintings of dragons. They famously change color with the seasons. Kumonryu compete in the Kawarimono category. Ochiba (落葉) is a light blue/gray koi with copper, bronze, or yellow (Kohaku-style) pattern, reminiscent of autumn leaves on water. The Japanese name means "fallen leaves". Koromo (衣) is a white fish with a Kohaku-style pattern with blue or black-edged scales only over the hi pattern. This variety first arose in the 1950s as a cross between a Kohaku and an Asagi. The most commonly encountered Koromo is an Ai Goromo, which is colored like a Kohaku, except each of the scales within the red patches has a blue or black edge to it. Less common is the Budo-Goromo, which has a darker (burgundy) hi overlay that gives it the appearance of bunches of grapes. Very rarely seen is the Tsumi-Goromo, which is similar to Budo-Goromo, but the hi pattern is such a dark burgundy that it appears nearly black. Hikari-moyomono (光模樣者) is a koi with colored markings over a metallic base or in two metallic colors. Kikokuryū (輝黒竜, literally "sparkle" or "glitter black dragon") is a metallic-skinned version of the Kumonryu. Kin-Kikokuryū (金輝黒竜, literally "gold sparkle black dragon" or "gold glitter black dragon") is a metallic-skinned version of the Kumonryu with a Kohaku-style hi pattern developed by Mr. Seiki Igarashi of Ojiya City. At least six different genetic subvarieties of this general variety are seen. Ghost koi (人面魚、じんめんぎょ), a hybrid of Ogon and wild carp with metallic scales, is considered by some to be not nishikigoi. Butterfly koi (鰭長錦鯉、ひれながにしきごい) is a hybrid of koi and Asian carp with long flowing fins. Various colorations depend on the koi stock used to cross. It also is considered by some to not be nishikigoi. Doitsu-goi (ドイツ鯉) originated by crossbreeding numerous different established varieties with "scaleless" German carp (generally, fish with only a single line of scales along each side of the dorsal fin). Also written as 独逸鯉, four main types of Doitsu scale patterns exist. The most common type (referred to above) has a row of scales beginning at the front of the dorsal fin and ending at the end of the dorsal fin (along both sides of the fin). The second type has a row of scales beginning where the head meets the shoulder and running the entire length of the fish (along both sides). The third type is the same as the second, with the addition of a line of (often quite large) scales running along the lateral line (along the side) of the fish, also referred to as "mirror koi". The fourth (and rarest) type is referred to as "armor koi" and is completely (or nearly) covered with very large scales that resemble plates of armor. It also is called Kagami-goi (鏡鯉、カガミゴイ), or mirror carp (ミラーカープ). Goldfish (金魚) were developed in China more than a thousand years ago by selectively breeding Prussian carp for color mutations. By the Song dynasty (960–1279), yellow, orange, white, and red-and-white colorations had been developed. Goldfish (Carassius auratus) and Prussian carp (Carassius gibelio) are now considered different species. Goldfish were introduced to Japan in the 16th century and to Europe in the 17th century. Koi, though, were developed from common carp in Japan in the 1820s. Koi are domesticated common carp (Cyprinus carpio) that are selected or culled for color; they are not a different species, but a subspecies, and will revert to the original coloration within a few generations if allowed to breed freely. The length of a koi can average up to about 3.28 feet. On average they also grow about 2 centimeters per month. On the other hand, goldfish may only grow to be around a foot. In general, goldfish tend to be smaller than koi, and have a greater variety of body shapes and fin and tail configurations. Koi varieties tend to have a common body shape, but have a greater variety of coloration and color patterns. They also have prominent barbels on the lip. Some goldfish varieties, such as the common goldfish, comet goldfish, and shubunkin, have body shapes and coloration that are similar to koi, and can be difficult to tell apart from koi when immature. 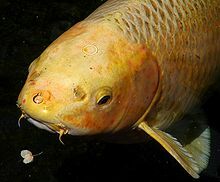 Goldfish and koi can interbreed; however, as they were developed from different species of carp, their offspring are sterile. The common carp is a hardy fish, and koi retain that durability. Koi are cold-water fish, but benefit from being kept in the 15–25 °C (59–77 °F) range, and do not react well to long, cold, winter temperatures; their immune systems are very weak below 10 °C. Koi ponds usually have a metre or more of depth in areas of the world that become warm during the summer, whereas in areas that have harsher winters, ponds generally have a minimum of 1.5 m (5 ft). Specific pond construction has been evolved by koi keepers intent on raising show-quality koi. The bright colors of koi put them at a severe disadvantage against predators; a white-skinned Kohaku is a visual dinner bell against the dark green of a pond. Herons, kingfishers, otters, raccoons, cats, foxes, badgers, and hedgehogs are all capable of emptying a pond of its fish. A well-designed outdoor pond has areas too deep for herons to stand, overhangs high enough above the water that mammals cannot reach in, and shade trees overhead to block the view of aerial passers-by. It may prove necessary to string nets or wires above the surface. A pond usually includes a pump and filtration system to keep the water clear. Koi are an omnivorous fish. They eat a wide variety of foods, including peas, lettuce, and watermelon. Koi food is designed not only to be nutritionally balanced, but also to float so as to encourage them to come to the surface. When they are eating, koi can be checked for parasites and ulcers. Naturally, koi are bottom feeders with a mouth configuration adapted for that. Some koi have a tendency to eat mostly from the bottom, so food producers create a mixed sinking and floating combination food. Koi recognize the persons feeding them and gather around them at feeding times. They can be trained to take food from one's hand. In the winter, their digestive systems slow nearly to a halt, and they eat very little, perhaps no more than nibbles of algae from the bottom. Feeding is not recommended when the water temperature drops below 10 °C (50 °F). Care should be taken by hobbyists that proper oxygenation, pH stabilization, and off-gassing occur over the winter in small ponds, so they do not perish. Their appetites do not come back until the water becomes warm in the spring. Koi have been reported to achieve ages of 100–200 years. One famous scarlet koi named "Hanako" was owned by several individuals, the last of whom was Komei Koshihara. In July 1974, a study of the growth rings of one of the koi's scales reported that Hanako was 226 years old. Some sources give an accepted age for the species at little more than 50 years. Koi are very hardy. With proper care, they resist many of the parasites that affect more sensitive tropical fish species, such as Trichodina, Epistylis, and Ichthyophthirius multifiliis infections. Water pH is important for maintaining koi's health. Water changes help reduce the risk of diseases and keep koi not stressed. Two of the biggest health concerns among koi breeders are the koi herpes virus (KHV) and rhabdovirus carpio, which causes spring viraemia of carp (SVC). No treatment is known for either disease. Some koi farms in Israel use the KV3 vaccine, developed by Prof. M. Kotler from the Hebrew University of Jerusalem and produced by Kovax, to immunise fish against KHV. Israel is currently the only country in the world to vaccinate koi against the KHV. The vaccine is injected into the fish when they are under one year old, and is accentuated by using an ultraviolet light. The vaccine has a 90% success rate and when immunized, the fish cannot succumb to a KHV outbreak and neither can the immunised koi pass KHV onto other fish in a pond. Only biosecurity measures such as prompt detection, isolation, and disinfection of tanks and equipment can prevent the spread of the disease and limit the loss of fish stock. 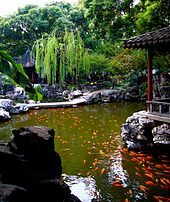 In 2002, spring viraemia struck an ornamental koi farm in Kernersville, North Carolina, and required complete depopulation of the ponds and a lengthy quarantine period. For a while after this, some koi farmers in neighboring states stopped importing fish for fear of infecting their own stocks. When koi naturally breed on their own they tend to spawn in the spring and summer seasons. The male will start following the female, swimming right behind her and nudging her. After the female koi releases her eggs they sink to the bottom of the pond and stay there. A sticky outer shell around the egg helps keep it in place so it does not float around. Although the female can produce many spawns, many of the fry do not survive due to being eaten by others. On average if the egg survives around 4–7 days the fry will be hatched from the egg. Like most fish, koi reproduce through spawning in which a female lays a vast number of eggs and one or more males fertilize them. Nurturing the resulting offspring (referred to as "fry") is a tricky and tedious job, usually done only by professionals. Although a koi breeder may carefully select the parents they wish based on their desired characteristics, the resulting fry nonetheless exhibit a wide range of color and quality. Koi produce thousands of offspring from a single spawning. However, unlike cattle, purebred dogs, or more relevantly, goldfish, the large majority of these offspring, even from the best champion-grade koi, are not acceptable as nishikigoi (they have no interesting colors) or may even be genetically defective. These unacceptable offspring are culled at various stages of development based on the breeder's expert eye and closely guarded trade techniques. Culled fry are usually destroyed or used as feeder fish (mostly used for feeding arowana due to the belief it will enhance its color), while older culls, within their first year between 3 and 6 inches long (also called tosai), are often sold as lower-grade, pond-quality koi. The semirandomized result of the koi's reproductive process has both advantages and disadvantages for the breeder. While it requires diligent oversight to narrow down the favorable result the breeder wants, it also makes possible the development of new varieties of koi within relatively few generations. Koi have been accidentally or deliberately released into the wild in every continent except Antarctica. They quickly revert to the natural coloration of common carp within a few generations. In many areas, they are considered an invasive species and pests. In the state of Queensland in Australia, they are considered noxious fish. Koi greatly increase the turbidity of the water because they are constantly stirring up the substrate. This makes waterways unattractive, reduces the abundance of aquatic plants, and can render the water unsuitable for swimming or drinking, even by livestock. In some countries, koi have caused so much damage to waterways that vast amounts of money and effort have been spent trying to eradicate them, largely unsuccessfully. In many areas of North America, koi are introduced into the artificial "water hazards" and ponds on golf courses to keep water-borne insect larvae under control through predation. The koi fish is symbolic in Japanese culture and is closely associated with the country's national identity. The koi fish is a symbol of luck, prosperity, and good fortune in Japan. In Sri Lanka, interior courtyards most often have one or several fish ponds dedicated to koi fish. Sri Lanka is the sixth largest cultivator of ornamental fish in the world after Singapore, Hong Kong, Malaysia, Thailand and the Philippines. ^ a b "Background information about goldfish". Retrieved 28 July 2006. ^ Genome Mapping and Genomics in Fishes and Aquatic Animals. Springer. 2008. p. 47. ISBN 978-3-540-73837-4. ^ Flajšhans, M.; Hulata, G. "Common carp – Cyprinus carpio" (PDF). genimpact.imr.no. Retrieved 29 July 2010. ^ a b c Freyhof, J. & Kottelat, M. (2008). "Cyprinus carpio". IUCN Red List of Threatened Species. Version 2013.2. International Union for Conservation of Nature. Retrieved 6 April 2014. ^ "MPKS Ray Jordan Koi History". Ray Jordan. Archived from the original on 23 July 2009. Retrieved 26 April 2009. ^ "Early Records". Netpets.org. Retrieved 11 April 2009. ^ Fletcher, Nick (1 January 1999). The Ultimate Koi. Interpet. ISBN 978-1-86054-146-9. ^ Allen, D. & Freyhof, J. (2012). "Cyprinus rubrofuscus". IUCN Red List of Threatened Species. Version 2016.2. International Union for Conservation of Nature. Retrieved 7 November 2016. ^ Froese, Rainer and Pauly, Daniel, eds. (2016). "Cyprinus rubrofuscus" in FishBase. November 2016 version. ^ Mabuchi, K.; Senou, H.; Suzuki, T.; Nishida, M. (2005). "Discovery of an ancient lineage of Cyprinus carpio from Lake Biwa, central Japan, based on mtDNA sequence data, with reference to possible multiple origins of koi". Journal of Fish Biology. 66 (6): 1516. doi:10.1111/j.0022-1112.2005.00676.x. ^ Grossa, Riho; Klaus Kohlmannb & Petra Kerstenb (2002). "PCR–RFLP analysis of the mitochondrial ND-3/4 and ND-5/6 gene polymorphisms in the European and East Asian subspecies of common carp (Cyprinus carpio L.)". Aquaculture. 204 (3–4): 507–516. doi:10.1016/S0044-8486(01)00836-5. ^ a b Chistiakov, D.A. ; Voronova, N.V (2009). "Genetic evolution and diversity of common carp Cyprinus carpio L.". Central European Journal of Biology. 4 (3): 304–312. doi:10.2478/s11535-009-0024-2. ^ Xu, P.; et al. (2014). "Genome sequence and genetic diversity of the common carp, Cyprinus carpio". Nature Genetics. 46 (11): 1212–1219. doi:10.1038/ng.3098. PMID 25240282. ^ Craig, J.F. (2015). Freshwater Fisheries Ecology. Wiley-Blackwell. p. 297. ISBN 978-1-118-39442-7. ^ Thai, B.T. ; Burridge, C.P. ; Pham, T.A. ; Austin, C.M. (2005). "Using mitochondrial nucleotide sequences to investigate diversity and genealogical relationships within common carp (Cyprinus carpio L.)". Anim. Genet. 1 (1): 22–28. doi:10.1111/j.1365-2052.2004.01215.x. PMID 15670127. ^ "Guide to Koi Varieties". mitchkoi.co.uk. Retrieved 12 April 2014. ^ Tamadachi M (1990). "Koi varieties". The Cult of the Koi. Neptune City, New Jersey: TFH Publications. p. 191. ISBN 978-0-86622-085-9. ^ Lee, Richard (3 August 2013). Essential Guide for Koi Fish Owner: How to Build and Maintain a Beautiful Koi Pond. Lulu Press, Inc. ISBN 978-1-304-28627-7. ^ "The difference between koi and goldfish". Living the Country Life. Retrieved 8 November 2016. ^ "Aquatic-oasis articles". Aquatic-oasis. Archived from the original on 22 June 2010. Retrieved 2 February 2012. ^ "Koi Feeding Guide". lagunakoi.com. Retrieved 2 October 2013. ^ "Temperatures to feed koi fish". mitchkoi.co.uk. Retrieved 1 April 2014. ^ Felicity Huntingford; Malcolm Jobling; Sunil Kadri (2012). Aquaculture and Behavior. John Wiley & Sons. pp. 12–. ISBN 978-1-4051-3089-9. ... and there are reports of fish that have achieved ages of 100–200 years (Purdom 1993; Billard 1999). ^ Barton, Laura (12 April 2007). "The Guardian". London: The Guardian. Retrieved 11 April 2009. ^ Carwardine, Mark (2008). Animal Records. Sterling Publishing Company. p. 201. ISBN 978-1-4027-5623-8. ^ "AnAge entry for Cyprinus carpio". genomics.senescence.inf. ^ "KV3 Vaccine against KHV". KoVax Ltd. – Specializes in Aqua culture vaccines development and Manufacturing. ^ "Blackwater Creek Koi Farms". koisale.com. ^ "Common Carp (Cyprinus carpio) – FactSheet". usgs.gov. ^ "The detail : Koi fish pond, Sri Lanka | the Voyageur". George C. Blasiola (1995). Koi: everything about selection, care, nutrition, diseases, breeding, pond design and maintenance, and popular aquatic plants. Hauppauge, New York: Barron's Educational Series. ISBN 978-0-8120-3568-1. David Twigg (2001). How to Keep Koi. New York: Howell Book House. ISBN 978-0-7645-6242-6. Wikimedia Commons has media related to Koi. Look up koi in Wiktionary, the free dictionary.